I'm teaming up with Brittany of Va Voom Vintage to bring you a survey about your shopping experience on etsy. Since I am nearing my one year anniversary of selling vintage clothing full time on etsy, I felt it was time to ask all of you about your experience with the site. These responses will help me, and other etsy sellers, tailor their practices and give you more of what you want -- and less of what you don't -- when it comes to shopping etsy. 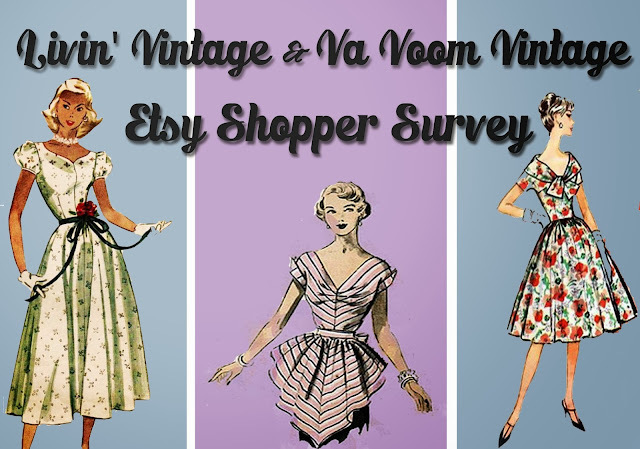 Taking the survey enters you for a chance to win a $25 store credit for Livin' Vintage Shop. One survey per person will be counted. Since the survery does not ask for your name, please comment here or on Brittany's blog with the url of your completion page. The survey is open now until November 18th. Results and winner of the store credit will be posted November 19th. I completed the survey! What a great way to get some of this information. This is all the survey link gives me https://survey.zoho.com/thankyou/thankyou.html! I have participated in the survey, I hope this helps you, I would be happy to be in at this giveaway. Good luck to all participants! I'd like to see the results when it's done!